Since the emergence of the celebrity chef concept, we all have a high level of exposure to many of these ideas. Names like Anthony Bourdain, Alton Brown, Emeril Lagasse and Gordon Ramsay invoke associations in the masses in a way they never did before. Because I grew up up in the Cajun food Mecca of southern Louisiana, relocated to the fusion Mecca of Houston, it was inevitable that I’d be a foodie. Its aromas, texture, flavor, science and preparation all intrigue me. Watching a program on chefs recently led me to wondering how food science could inform game design science. The concerns of chefs and game designers align in three major areas–Spicing, Coursing, and Presentation. Spices are meant to enhance, not overpower. Spices stimulate the palette. Spices make a meal memorable. Master chefs control and balance each flavor. They know that overspicing leads to a confused palette and a poor experience for the diner. We must be the chefs of our games. Dice, cards, bags of chits, cubes, our own mechanisms–there are so many elements at your fingertips that the urge to add all of them can be almost irresistible. Remember always that overspicing leads to a poor experience. Control and balance each element. Add twists, turns and variation only where variation is needed. Add exotic mechanisms only where they lift the game experience and stimulate play. Keep the other elements simple and familiar for your players. Is your game an appetizer? Or is it a dessert? Or should it serve as a main course? Appetizers should be light and spicy. They should build anticipation. In other words, appetizer games will tend to be lighter, shorter, and feature prominent random elements. A list of appetizers would easily include Easy Come, Easy Go, Can’t Stop, Cthulhu Dice, or TransAmerica. Main courses can be spicy–featuring multiple new mechanisms–or mild–focusing on the perfection of classic mechanisms–but they must be solid and filling. They are the center of the day’s gaming and they should be memorable. Main courses can be longer. They can heavier rules. They can have deep gameplay. 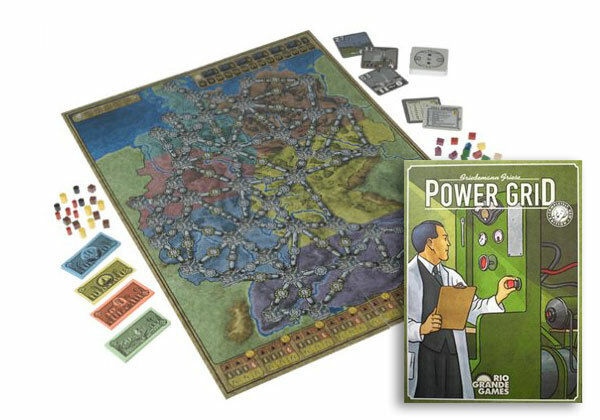 My list of main course favorites would feature Tichu, Ingenious , and Power Grid. Desserts should be tranquil and pleasant. They bring the meal to a close and provide opportunity to reflect. they feature little, if any, spice. Dessert games should feature familiar mechanisms and play. The best ones often include a strong social element as well. Carcassonne, Say Anything, and 6 Nimmt! are all good dessert games. “You taste with your eyes first” is a common adage among chefs and they are absolutely right. This means that the dish should visually announce what the diner will experience. This is why modern American chefs layer ingredients on the plate; to foreshadow the layers of flavor to come. Our games can similarly announce their flavor. When elements like the timing track, scoring chart, turn order, or placement effects are prominently labeled on the game components, our players will have a good idea of the game to come well before the first rule is taught. Eurogames have been particularly good at this kind of foreshadowing. Because language-independent components have remained as a major design objective throughout the last 20 years, their designers and graphic artists are extremely skilled at offering game components which strongly imply their function. Designers interested in good component design should take a look at Eine Gegen Eine, Ticket To Ride and A Castle for All Seasons. What do you think of the analogy between chefs and game designers? What analogy might you have chosen instead? Why? Share with your fellow readers in the comments below. And if you’re enjoying what you’re reading, create an account with WordPress and follow this blog. If you keep reading, I’ll keep writing. Microgames are something many publishers need from time to times–particularly so for mainstream publishers. With the huge success of Love Letter, microgames have begun appearing on gamer radar as well. When thinking of a microgame, four criteria spring to mind: (1) short playing time,(2) short rules, (3) low component count and (4) low price point. The best ones also feature (5) rules which are short but deep. The aforementioned Love Letter satisfies all of these criteria, as do Cthulhu Dice, chess, 6 Nimmt!, and my own Nobody But Us Chickens. Covering microgames has been on this column’s “to do” topic list since its inception but finding the right way to present it eluded me until recently when a publisher I work with expressed an approaching need for microgames. The opportunity to write small games excited me. Most of my design work lately has been focused on games with a large number of moving parts. Crafting a tight game with a confined design space was a welcome change of pace. Several days of brainstorming yielded a few promising ideas. Half a dozen of them seemed promising. 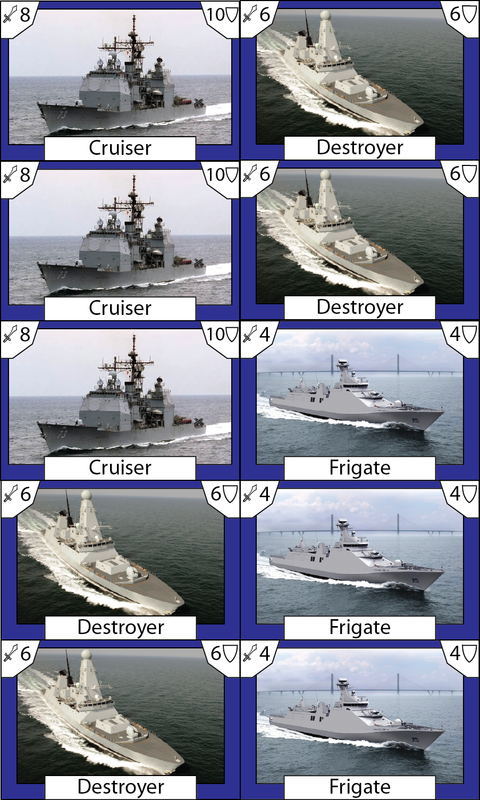 These were fabricated into playable prototypes and brought to the test group. Predictably enough, some didn’t work. One of them however has evolved into something rather interesting. I showed it to Kevin Brusky–Mr. APE Games–and he agreed. 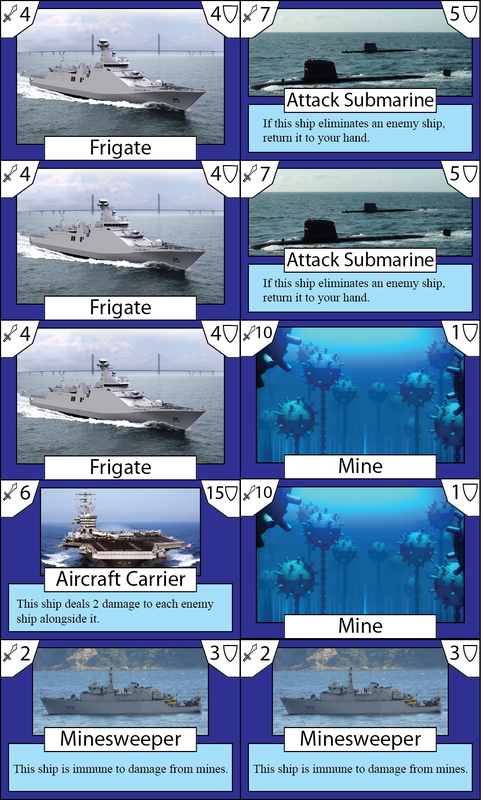 With plans to move forward now in place, I thought you might enjoy coming along for the ride as this microgame gets developed. 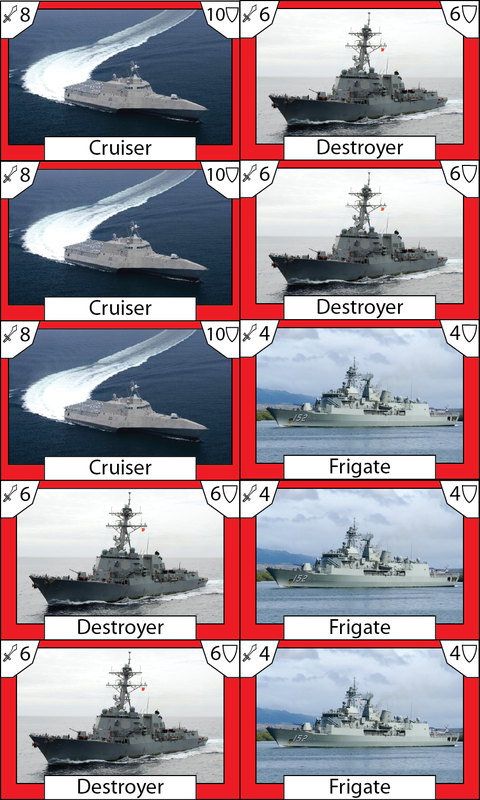 The high concept was to combine Stratego with Battleship. Everything at this stage is vague. Changes were happening even as the first ideas were hitting the page. I thought initially that the game would support a 5×5 play space. By the end of the page, I’d realized this would give players too much room to dance around one another. Bringing conflict earlier yields a stronger narrative. Feel free to print everything and take it out for a spin yourself. Let’s see if you would make the same changes I did. Next time, we will go over the results of the first tests; what worked, what didn’t, and what I did about it. What’s your favorite Microgame? What do you like best about it? Have you written one? How did your players respond to it? Share with your fellow readers in the comments below. And if you’re enjoying what you’re reading, create an account with WordPress (http://wordpress.com/) and follow this blog. You keep reading. I’ll keep writing. 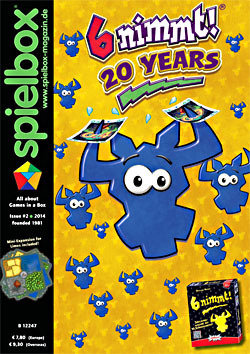 The latest issue of Spielbox magazine arrived in my mailbox a few days ago. Its cover proclaimed this to be the 20-year anniversary of 6 nimmt! The article about this auspicious birthday was something of a two-page trip down memory lane for Joe Nikisch and Uwe Mölter. This history lesson was interesting enough for a casual read. It was not the exploration of its mechanisms and influence I’d hoped for. To be clear, Nikisch does discuss mechanisms and impact in his article, just not in great detail. Let’s say a bit more about this landmark game. 6 Nimmt! is remarkably elegant. The rules at their core are extremely straightforward–Horns are points and points are bad. Play a card simultaneously and resolve them in ascending order. Each card goes to the pile it is most closely over. The 6th card takes the pile it lands in but stays behind. There is only one “fringe rule;” a card too low for any pile takes a pile of your choice and stays in its place. Quick, clean rules like these favor such quick-playing games and are ideal for sharing our hobby with non-gaming family or friends. Like Hearts or Golf, 6 nimmt! players win by avoiding penalties rather than by gaining points. Having worked on a few games of this type, I can tell they are darned tricky to balance. Kramer found that balance in the places he chose to dole out the penalties. Every card is worth at least one penalty point but cards ending in 5 have two points, cards ending in 0 have three points and multiples of 11 have five. The 55 card, being both a card ending in 5 and a multiple of 11 is singularly nasty–it carries seven penalty points! This spread is more than sufficient to keep players watching every pile and its potential penalties. One element the Spielbox article did focus on was the game’s approach to simultaneous play. Players in 6 nimmt! choose a card to play simultaneously but execute the cards in increasing order. According to the article, this two-stage version of simultaneous play was completely revolutionary at the time. There is a unique tempo as you alternate between first attempting to read your opponents and second watch the results of your decision play out. Because play is simultaneous, some of its detractors will assert that you can simply play a random card each round to get a similar effect. This argument has been put up against a large number of simultaneous play games, including my own Nobody But Us Chickens. The Spielbox article defends this approach as a valid method of play. I cannot be so charitable. While playing cards at random misses the spirit of the game. Getting a good read on your opponents, spotting a good spot to drop a bad card, these elements are essential to fully experiencing 6 Nimmt! To play otherwise is to deny yourself a great gaming experience. On the other hand, 6 nimmt! does fall short in scaling. The game with 3-5 players is tense and strategic but as additional players are added, the game grows increasingly chaotic and if the maximum 10 players are participating, it does begin to feel as random as its detractors insist. Many simultaneous-play games stand on the shoulders of the 6 Nimmt! giant. Games like Die Glücksritter–which alternate between simultaneous and ordered play are doubly indebted. If you have any plan to design a simultaneous play game, 6 nimmt! is a must-play. Through its simplicity, Wolfgang Kramer shows how powerful a single, cleanly executed, mechanism can be. What are the landmark games? Which titles should every game enthusiast play at least once? 6 nimmt! is my suggestion. Have you played 6 nimmt!? What do you think of it as a landmark game? What other games do you see as notable ancestors to newer games? Share with your fellow readers in the comments below. And if you’re enjoying what you’re reading, create and account with WordPress and follow this blog. If you keep reading, I’ll keep writing.